ST. GEORGE – An 8-year-old boy was pulled from an ice-covered pond in New Harmony after a Washington County Sheriff’s sergeant punched through the ice to get him out Monday. Responders received the report of a possible drowning in the area of 3100 East and 2500 South in New Harmony just after 5 p.m., Washington County Sheriff’s Lt. Dave Crouse said in a telephone interview immediately after the incident. The boy had been playing with siblings when he ran after a family dog onto the thin ice of the pond and broke though. One of the other children tried help the boy but was unable to do so, prompting him to run to other family members who called 911. 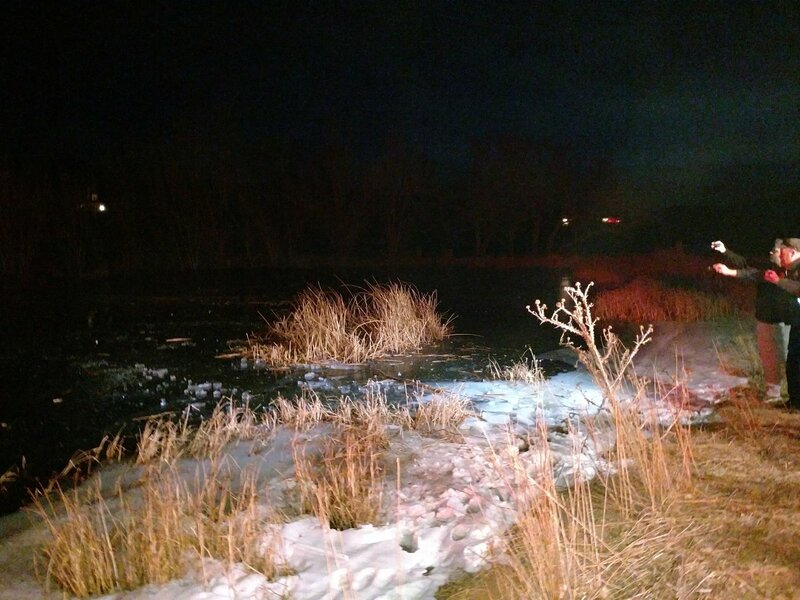 The sergeant, who was one of the first to arrive at the scene, punched through the ice over the pond and pulled the boy out, Crouse said. “Sergeant (Aaron) Thompson made the personal decision to attempt rescuing the victim without the aid of specialized equipment. Thompson stripped his police gear and immediately entered the water to locate the child,” Crouse said in a statement issued around 8 p.m. The boy was last seen around 25 feet from the shore and Thompson began punching through the ice to create a pathway for the boy. “Thompson was able to locate the victim under the ice and bring him back to shore where awaiting medical personnel began treating him,” Crouse said in the statement. The boy was taken by Intermountain Healthcare’s Life Flight to Dixie Regional Medical Center, according to the statement. Additional details regarding the boy’s condition have not yet been released. Thompson was also taken to the hospital where he was treated for potential hypothermia, as well as cuts and abrasions he received while breaking through the ice, Crouse said. Sergeant Thompson, thank you for being a true hero, risking your own life to save another. I’m sending prayers that the boy and the Sergeant will recover quickly. He wouldn’t of had a chance without you Sergeant. Great job by sargeant but I say where are the parents? They shove kids outside no supervision and kids find trouble…why wasn,5 the dog on a lease? Sandie, that was an extremely calloused remark. Humor or not. Mmsandie the boy was EIGHT YEARS OLD! Clearly you’ve never been a parent of an 8yo in the country, it’s part of growing up. His parents are not at fault at all. This was a freak accident. So how about not blaming the poor parents who’s hearts are aching.